Blogger outreach has seriously become one of the best ways to grow a blog, business, or brand. Several bloggers and marketers have grown because of their outreach, including recent influencers such as Jason Quey and Tor Refsland. Well, it’s something that mainly deals with contacting people through email and sometimes social media. And if you’re not good with people, then yeah. It can be a tough thing to do. But you know what? I’ve done some blogger outreach. I haven’t had the successes that Jason and Tor have had up there. But I have had some. In 2015, I had almost nothing good going for me. I might have had a handful of subscribers, maybe 100 visits per month, and only made about $100 all year (let’s say $120 so we can have an average of $10 per month). For a blog that was started in early 2014, I knew that wasn’t great. Considering the time and resources I spent, I should have made 10x that. So in the second half of December, I looked for something that would help me do better in 2016. And that’s where influencer marketing and blogger outreach came in. I read everything I could find on the topic (I still do). And when I finally started implementing my outreach strategy, I had to first ask myself if my blog was the right thing for me. At the time, my blog was in the make money niche. Its content was all over the place. It had posts on blogging, making money, affiliate marketing, and even had reviews of marketing programs/products. Its domain was sort of ugly, too. It was a “make money online” type of domain name. So, I sold it and started a new one that focused more on helping struggling bloggers (instead of practically everything). 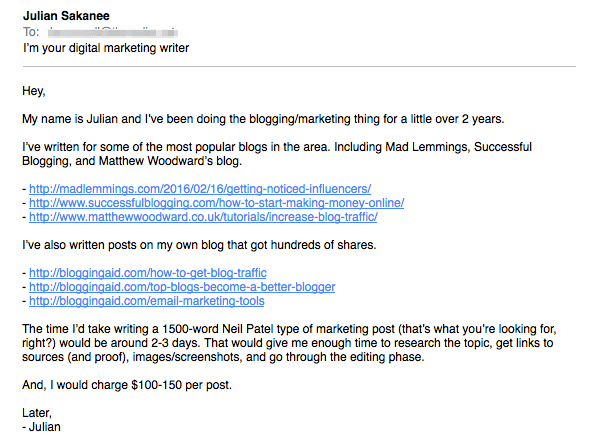 Before the new year, Blogging Aid was born…again, I guess (it was an expired domain). In its first month, it got nearly 3000 hits from over 1300 people. 90% of that was because of my outreach efforts. The tips I’ll share here will help your chances at connecting with the bloggers and influencers you want to connect with. These are just some examples of not following the simplest personalization rule, always use first names. Nothing throws people off like when they’re not addressed by their first name. Some people may even delete the email without reading it all. Why? Because they’ll think it’s being sent by some automation system and not a real-life person. Your follow-up email may go straight to the trash. Learn your contacts’ first names. It’s not hard. In fact, it’s probably one of the easier things you’ll ever do. Check out their About page or their social media pages. You could even go to their blog page and check out the authors’ names under or around the blog posts’ headlines. 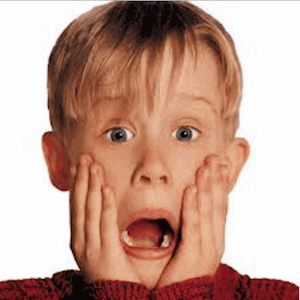 Do you want to know what people do when they see a massive email? They’ll hit the delete button before you could even type “Hello.” Literally. Especially bloggers and influencers. They’re extremely busy people. So, make sure you never go off topic. Ever. Why? you ask. Wouldn’t it be 100x easier if you bulk-send your outreach emails? you say. Yes. But there’s a bad side to this. And that bad side isn’t exactly on your end, either. The more people you have in your bulk-send list, the more emails the people in your bulk-send list get. They may have only received the one email from you, but every time any one of them hit reply, everybody else will get an additional email. How do I know? Because I experienced it first hand. And it almost ruined some of my relationships with bloggers and influencers. I created an expert roundup for Blogging Aid that featured more than 60 pros. And you know roundups, right? Unless you have a decent number of readers, you better promote the crap out of it for it to get some traffic. I knew I had to let each of the contributors know the roundup was live. So that’s what I did. But as you’d know, sending 60+ emails can get boring. And I hate being bored. So, even though I knew bulk-sending was bad, I did it anyway. I sent the same email to more than 20 people. In fact, subject lines may even be as important as the meat of the email itself. Why? Because it’s the first thing the email recipient sees. And it’s the reason why people actually open emails. That, and the name. 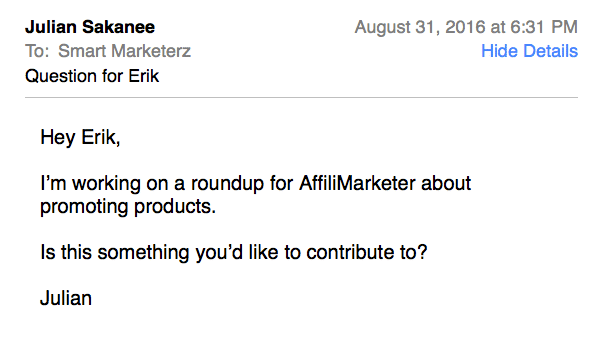 But since your name isn’t exactly Seth Godin or Neil Patel, you need a killer subject line. Well, you have a couple ways to do this. You can go the obvious way and basically tell them what you want. You can go the less obviously way and give them a little teaser. Both ways work. There’s no doubt about that. The obvious way works because, well, it’s obvious. Right? The less obvious way works because it creates curiosity. Would you care to elaborate? I’m glad you asked. The person receiving the email will know what it’s about immediately and will either open/reply if he’s up for it or delete it if he’s not. The question could be about anything, right? So that would almost leave the email recipient no choice but to click and read the email. Email outreach templates. They’re great for saving time. I’m sure you’ve heard of them. Maybe you’ve even seen them in your inbox. Anyway, I noticed you mentioned [post’s name] under [subheading section]. This is probably one of the most popular templates for link builders. It shows that you love their work, it mentions content similar to yours, and it asks if they can add your link to their post. I’m sure it has generated thousands of links. Many outreach pros have come up with highly-effective email templates over the years. Ninja Outreach curated 34 of them in this blog post. I suggest you use some of them. 1 or more for building links. 1 or more for asking for shares. 1 or more for requesting feedback. 1 or more for pitching guest posts. 1 or more for expert roundups. You’ll also need follow-up email templates. You should also consider creating your own templates and scripts. Some of the pros, including Sujan Patel, think that by “including an interesting sign-off” at the end of your emails, you can increase your chances at getting replies. You know the sign-off, right? “Cheers, Julian” or “To your success, Billy” or “All the best, Sam”. Why should you care about this part? Every little piece of your email is important. Your subject line, your greeting, everything. But for the sign-off in particular, if for whatever reason they didn’t like your email, then it’s the last chance you have at getting them to hit reply . You could go one-up and say something like “Your Biggest Fan,” but that would just make you a liar, wouldn’t it? It’s the things you do before you actually reach out so you’d have a better chance at success. Basically, it’s all about getting noticed by the pros and influencers. So how do you do pre-outreach? There are more than a couple ways to do this. One tactic probably wouldn’t cut it, though. Especially in areas like business, blogging, marketing, and health/nutrition. You’d have to do a series of things. For example, a lot of experts recommend blog commenting, content sharing, email subscribing, linking out / mentioning, and using the pros’ methods for getting noticed. So, you’d pick a couple of these and implement them. Maybe even all of them. If they acknowledge, like a thank you on social media or a reply to your blog comment, you’d likely be recognized when you’re doing the outreach. 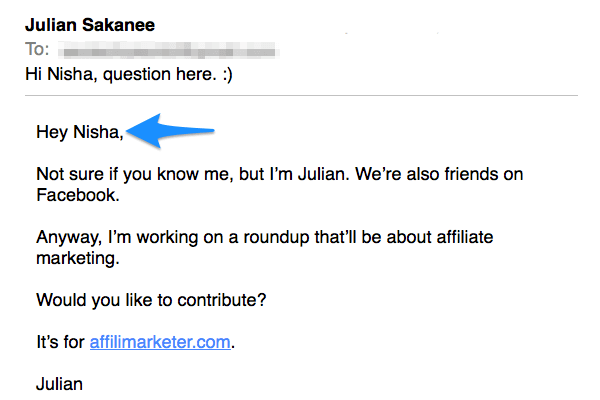 Another easy pre-outreach tactic is the one where you send sort of a teaser email before you actually ask for your shares, links, or whatever. For this to work, you’d be sending 2 or 3 emails to your targets/contacts. This is where you’ll ask if they’re interested in your blog’s topic(s). There are definitely some awesome tips there. I especially like [TECHNIQUE A]. I’m even working on a post right now on [SIMILAR TOPIC]. You don’t really have to send this one. 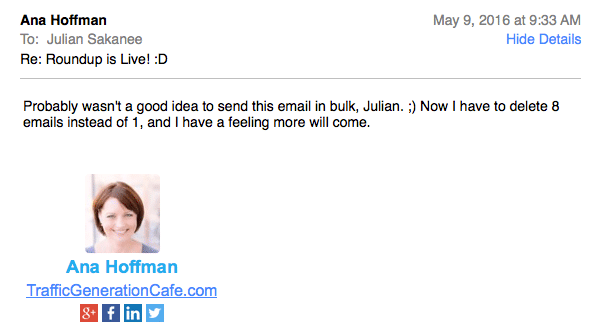 But to be friendly, and to not be rude, this easy email should be a must. This is where you’ll send them the link to your post and ask them for whatever it is you want. Backlinks, for example. Would you consider adding it as a resource in your post about [TOPIC]? For more on pre-outreach, visit the guide from Mad Lemmings. Most of the people you reach out to likely won’t do what you want because it may take too much out of their busy schedules. This is especially the case in link building outreach and content promotion outreach. Sometimes, expert roundup posts, too. When you’re asking for a link, and if they yes, they’d have to edit their post and possibly add a line or two of text just to make your link look natural. Easy…offer to provide a sentence or paragraph they’d add when they’re linking out to you. This would mean you’d actually have to read their post and find the perfect spot to place your link. Let’s go with another example. Content promotion outreach. 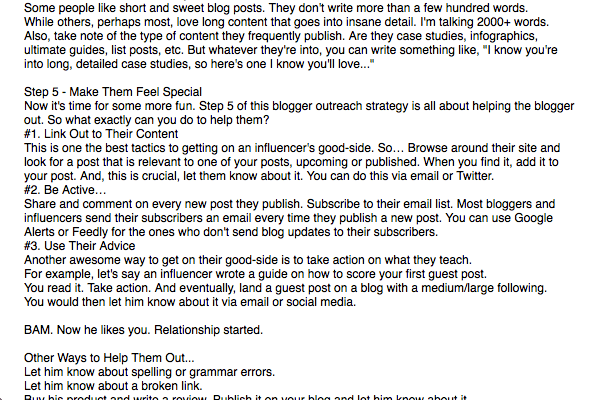 Let’s say you’re trying to get influencers to share a brand new epic guide you just published. You see that? He includes a “share URL” that directly goes to a social media site and shares your post. And it’s actually pretty easy to do. All you need to do is click one of your share buttons, Facebook for example, copy the URL and paste it into your outreach email. If you’re on Twitter, you can use Click-to-Tweet, a tool that’ll automatically do this for you (for free). So, what exactly do I mean by “giving value”? Basically, the added value is something that the others (the competition) don’t have. For example, if you’re reaching out to build links, your added value can be within your content. Let’s say you’re in the marketing space and you’re building links to a post about guest blogging. Your added value could be something that hasn’t been mentioned by any of the other guides out there. For example, an extra step or a new tool. You could do the same thing when you’re asking for shares. Anyway, I noticed you mentioned [POST NAME]. Great post, BTW. don’t mention that basically guarantees great results. I know your readers would appreciate it. If you would like to see, I can send you the link. 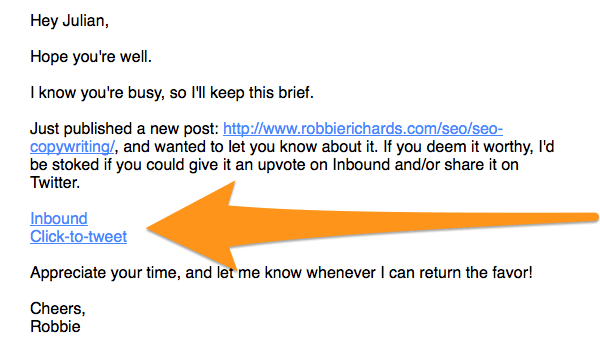 Another thing you can do is mention or link to them in your content, then let them know. For guest posts, you’d show them your best stuff. You’d show them your writing is so good they’d be fools to not let you contribute to their blogs. That means your “best stuff” would have to be epic. But you already that. Right? For building relationships, you’d basically help them in any way you can. Like friends. So, you would always share their content, mention them in your content, leave them blog comments, and even let them know of blog errors (ex: broken links or spelling errors). One thing that works best, though, is proving they’re the real deal. Meaning you’d put their best methods into action, wait for great results, and share it with them. Blogger outreach is a growth strategy that has been proven time and time again that it is one of the most effective. Pros like Tor Refsland and Jason Quey have used it to grow their brands and businesses. And so should you. If you get started now and have these 9 tips in the back of your mind, growing your blog (and brand) through blogger outreach is as possible as a White Christmas in Canada. Julian Sakanee is a blogger. He is the founder of BloggingAid and owner of AffiliMarketer. Awesome post… Thanks Julian and Rose.. . I have a question… If I want to send a mail to over 3000 people, do I do it one at a time or there is a way to get it done apart from bulk sending? I always start with a small batch of max 50 people of people you know and ask them for feedback. Improve your message based on the feedbacks that you get. Then you may start with 3,000 people. Repeat this after 2 wks. ‘Try to start your campaign over different platforms (Gmail, Twitter, Facebook, LinkedIn, etc.). Timing is also important; most people read their emails on Tuesday morning, Wed – Thursday afternoon / evening. Friday morning and Sunday afternoon & evening. Do some research on our platform.